Special Offer 5 % Discount on minimum 10 pax group booking!!! All hotel taxes (as per itinerary). Vehicle will run on point to point basis, not on disposal basis. Return airfare /Train fare5 % Discount on minimum 10 pax group booking!!! Hurry Limited Period Offer!! !All kind of personal expenses such as tips, laundry, telephone bills & Beverages. Entry fees and Guide charges. Any cost arising due to natural calamities like, landslides, and road Blockage, political disturbances (strikes), etc (to be borne by the Client, which is directly payable on the spot). Arrive at Imphal airport you will be received and greet by our company representative. After refreshment visit Sri Govindjee Temple, the Shaheed Minar, Museum and Woman Market. The eye catching Minar also serves as an ideal background for photo-shoots. Overnight at Imphal. Today visit Loktak Lake and Keibul Lamjao National park. The Loktak Lake is the largest fresh water lake in the North-East. The Keibul Lamjao National Park is located in the south western part of Loktak Lake. Keibul Lamjao national park is the only floating park in the world. After that visit War Cemeteries. Evening free for leisure. Overnight at Imphal. Morning after breakfast proceeds to Kohima (215 km, approx.) –the capital of Nagaland, a newly created state of India. Kohima is a beautiful town known to the world for halting the Japanese force during the Second World War. On the way visit the Heritage Village of Kohima, Kisama. The nomenclature of Kisama is derived from two villages namely, Kigwema (KI) and Phesama (SA) and MA which means Village, on whose land the Naga Heritage Village is established and commissioned by the State Government of Nagaland. Overnight at Kohima. Today morning ready for Kohima sightseeing. At Kohima visit –The World War II Cemetery that lies in a beautiful surrounding, the Cathedral of Reconciliation, the Bara Basti, the Nagaland Museum. And visit Khonoma Village. 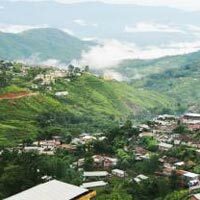 Khonoma is a small little village which showcases the delightful views of Nagaland`s natural beauty and ecological diversity. Overnight at Kohima. This morning proceed to Kaziranga National Park (215km, approx.) – a World Heritage Site and Tiger Reserve, covering an area of 430 Sq. km. It is the home to more than 80% of world’s Rhino population. On the way visit Ruin of Kachari Kingdom at Dimapur. Overnight at Kaziranga. Today morning proceed to Bomdila - the headquarter of west Kameng District of Arunachal Pradesh and also known for its Buddhist monasteries. It has a lot of attractions for the visitors for its cool climate. On arrival Bomdila, check in at hotel. Evening free for leisure. Overnight at Bomdila. This morning check out from hotel & visit Bomdila Monastery & proceed to Tawang – the land of Monpa Tribes & major centre of the Mahayana Buddhists. On the way to Tawang lies the world's second highest pass – The Sela Pass (13,700ft) which run through a small ridge & along a lake called Paradise Lake. Also visit Jaswantgarh, a memorial to the brave soldier who single tried to hold of approaching Chinese from the pass during the 1962 Indo-Chinese war. On arrival check in hotel. Overnight at Tawang. In the morning go for sightseeing in and around Tawang. Visit the Penga Ten TSO Lake (P.T.S.O. ), War Memorial and Tawang Monastery. The Monastery is 400-year-old and adorned with the 18 ft. High statue of Lord Buddha. ‘The Land of Dawn-lit Mountain’ at 3500m gives you unparallel purity of nature. Overnight at Tawang. Morning drive to Bomdila. On the way enjoy the beauty and majesty of Jung Water Fall and visit Kiwi Garden and Dirang Valley. Overnight at Bomdila. After Breakfast drive to Tezpur, At Tezpur visit – Mahabhairava mandir, Chitralekha uddyan, Agnigarh and Ganesh Ghat. Overnight at Tezpur. After breakfast drive to Guwahati, afternoon visit Kamakhya Temple is dedicated to the mother goddess Kamakhya, one of the oldest of the 51 Shakti Pithas & Umananda temple in Brahmputra River. After breakfast drive to Shillong Enroute visits the largest manmade lake of Northeast India - Umiam Lake. On arrival visit Don Bosco Museum. The museum exhibits a wide collection of regional artwork, attires, accoutrements, handicrafts, ornamentation, photographs and weapons. After sightseeing check in at hotel. Evening is free for leisure. Overnight at Shillong. After breakfast proceed for full day excursion to Cherrapunjee - known as the wettest place on the earth. En route visit the Shillong Peak, is the highest point in state of Meghalaya. Shillong Peak is a view-point where you can get breathtaking view of Shillong city, visit Famous Elephant Falls - it is a two-tier waterfall set in the dingles of the rocks. On arrival at Cherrapunjee visit Nohkalikai Falls is the tallest (fourth highest in World) plunge waterfall in India. Have a packed lunch. After lunch enjoys the thrilling experience of Mawsmai Cave, the caves are made of limestone. After sightseeing drive back to Shillong. Evening is free for shopping. Overnight at Shillong. After breakfast drive to Silchar. On arrival at Silchar check in hotel. Overnight at Silchar. This morning proceed to Aizwal - the scenic capital of Mizoram. On arrival at Aizwal check in hotel. visit – Mizoram State museum on Macdonald Hill for a deeper insight into Mizo culture & shop for traditional crafts. Visit Bara Bazar. Overnight at Aizwal. All kind of personal expenses such as tips, laundry, telephone bills & Beverages.